That, Detective, Is the Right Question! : Shame In Australia!! No Conscience...Ponting telling umpire that Ganguly was caught. Much will be talked about the current India-Australia test series for long. Mainly, the Sydney test will be remembered by the Cricket lovers as a proof against no-ethics Australian team and the poor umpiring by Buckner and Bensen. In this test, almost 7 umpiring decisions went against India and it can be easily proved by looking at the TV footage that all were wrong. Firstly, there was the decision about Andrew Symonds. When Australians were at a poor score, Symonds was caught behind wickets but not given out by Buckner. Symonds went on to hit a century. Even Symonds later accepted the fact that he was indeed out when he was on 30. If this century were not happened, imagine the results of the test where Indians reached to a 500+ score. But this was not all. Worse was yet to come. In all of the glaring mistakes, 2 were really worst of all - when Dravid and Ganguly were given out. In Dravid's case, he was given out by caught behind the wickets. But in TV footage, it could be clearly seen that the ball did not even touch David's bat or gloves. But the immoral Aussies started a jubilant celebration without even waiting for Umpire's decision. Umpire also succumbed (?) to this and gave Dravid out. This was not enough. Ganguly's catch was not a catch in first place. Secondly, the catch was not even completed securely. The ball touched the ground before celebrations again started. Here, Bensen, the umpire, did the thing which was utterly outrageous. He asked Ponting about whether it was a catch or not. Ponting, the man who is the least trustworthy immediately indicated out ans umpire followed. C'mmon Mr. Bensen! Are you there to please Poting and cronies, or what? Bensen should have consulted the leg umpire in first place and then the third umpire who is paid to do this job. But this was not done. Umpire asked a fielding captain about decision! 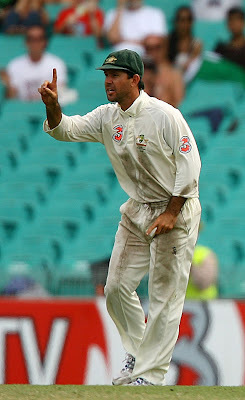 Ponting, who is known to Indians for his sucking behaviour with Mr. Sharad Pawar. In India, we respect elder people. This was not a tradition of Australian Ponting, whose misbehaviour angered the nation. He was not a trustworthy guy. This point can be proved from the fact that, before Ganguly's catch, Ponting appealed on a catch he never completed. And he appealed with all his cells in body, inspite of knowing that the catch was not completed. If Steve Buckner and Bensen had clear conscience and good physical abilities like good sight and good hearing ability, the results of the second test could have been certainly different. And read about it here in Sydney Morning Herald.